While the implementation of mass detentions and “assimilation” of Muslims is being intensified in Xinjiang, the CCP is also exporting its experience of “governing” Xinjiang to other parts of the country, where Hui Muslims live. In particular, various campaigns to crack down on and eliminate the “generalization of halal” are being continuously promoted in areas with Muslim communities in every province. By “generalization of halal,” the CCP means the use of symbols of Muslim identity and the respect of Muslim prescriptions in areas of life other than food. Campaigns against the “generalization of halal,” however, normally end up targeting also halal food itself. Bitter Winter obtained a document entitled Notice on Comprehensively Investigating and Regulating Arabic Symbols and Religious Elements in Public Places and the Issue of “Generalization of Halal,” which was issued by a local government in Hebei Province at the beginning of the year. The notice states that, according to requirements from the central, provincial and municipal governments, Arabic-language symbols and religious elements in public places, as well as “generalization of halal” practices, must be resolutely brought under control. In addition, the notice requires that Arabic symbols and religious elements never be used in public places and public facilities. Existing Arabic-language symbols and religious elements must be “rectified” through demolition or modification. The Chinese characters meaning “halal” and Arabic-language symbols at halal restaurants, in school canteens for Muslim students, on halal foods, and in Muslim households are also banned, as part of this “rectification” campaign. On January 8 of this year, the English edition of Global Times also reported that the CCP authorities are thoroughly checking and removing Arabic symbols and prohibiting their use in public places, including restaurants, in Hebei Province. The government believes that “pan-Arabization” can be restrained through this action. A local Muslim insisted with Bitter Winter that the Arabic language has symbolic meaning for Muslims, and that this move by the authorities is clearly intended to remove the ethnic and religious identity from the hearts of the Hui people. According to the information received by Bitter Winter, the authorities in Hebei Province have launched a full-scale campaign to remove Arabic symbols since last year. In October 2018, a massive removal of Arabic symbols took place in Mengcun Hui Autonomous County, under the jurisdiction of Cangzhou City in northern Hebei Province. Most of the Arabic signs and symbols at shops along the streets were removed – from all restaurants, grocery stores, and other shops. Three new marks from paint, tape, etc. 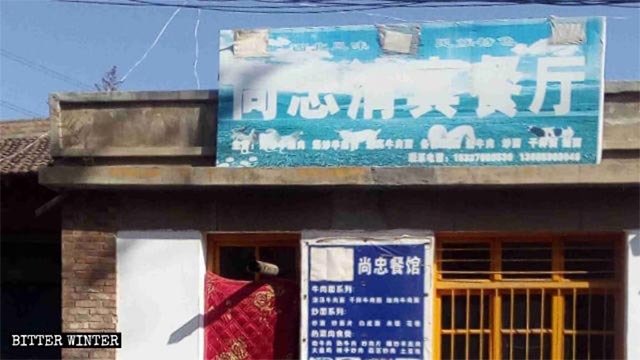 appear on the signboard of an ethnic Hui restaurant in Taipingdian Township of Baiyin City, Gansu Province. 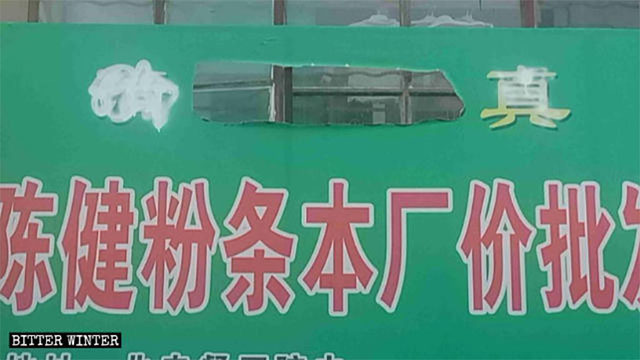 Just as in Hebei Province, the campaign to remove the Chinese characters meaning “halal” and Arabic symbols is also continuing to unfold in Gansu Province, which neighbors Xinjiang. After Linxia Hui Autonomous Prefecture, Pingliang is the prefecture-level city in Gansu with the largest Muslim population of that province. The Muslim ethnic culture in Pingliang has also suffered a severe crackdown. Last year, the local authorities ordered the closure of an Arabic language school for poor students. The campaign to remove the word “halal” and other Arabic words is still ongoing. 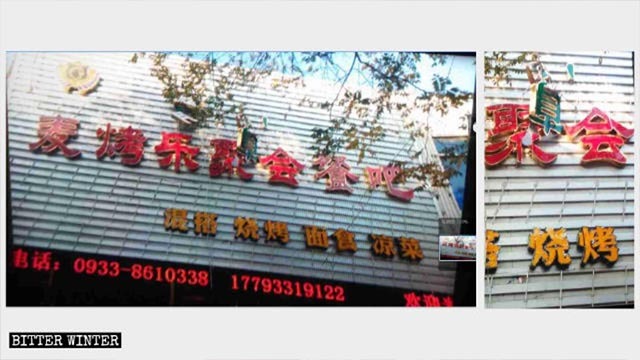 The word “halal” was cut off from the signboard of a restaurant on Zijincheng Street, and is suspended in mid-air. An Arabic-language symbol was removed from a shop in the Shagangzi Wholesale Market on Jiefang Road in Pingliang city. I visited several shopkeepers at random. When I mentioned the removal of certain words from signboards by urban management officers, some shopkeepers said that the urban management officers never notified them in advance and were just directly and savagely “enforcing the law” instead. 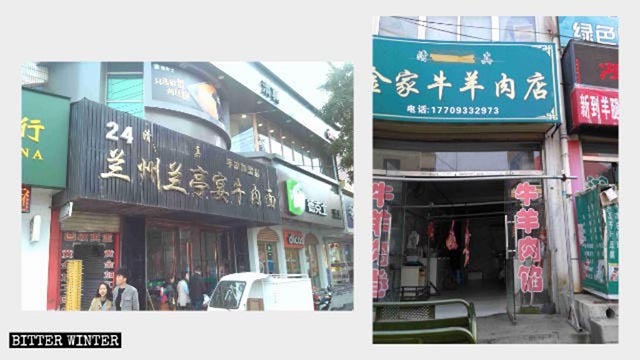 Arabic words were removed from the signboard of a beef noodle restaurant and painted over on the signboard of a butcher’s shop in Pingliang city. “These urban management officers are just like bandits! They keep coming to find faults with us and won’t let us live! If such harassment continues, our shop won’t even be able to stay open,” the elderly man said helplessly.